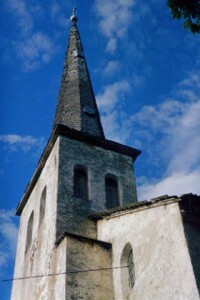 Before renovation, St. Martin’s Lutheran Church's steeple and roof was in very poor condition. Inspired to help others by the community and spirit present during her time at Gustavus Adolphus College, her family, and God’s grace, Miriam Lind Lagus ’61 spent more than ten years raising funds to restore St. Martin’s Lutheran Church in Martna, Estonia, a parish her father once served. More than $90,000 was raised for repairs to this church half a world away. Lagus was born in Estonia in 1939 and spent her earliest childhood years in Estonia along with her sister Reet (Lind) Henze ’62 and her brother Mart Lind ’65. Her father, Pastor S. Eduard Lind, graduated from Tartu University in Estonia, which was founded by Swedish King Gustavus Adolphus in 1632 and served St. Martin’s Lutheran Church from 1937 to 1944. In 1944, the family fled the country as Estonia fell to the advancing Soviet forces in World War II. Although her parents did not want to leave their home, they had no choice, and departed on the last ship to leave the country. 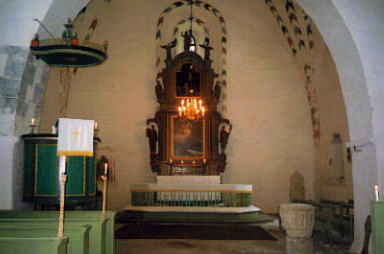 The church community survived during the 50 years that Estonia remained occupied by the Soviets. The organist kept many of the church records in his home where services continued throughout the years. In 1996, Lagus and her husband revisited Estonia and the church, and learned that rain water was destroying the 500-year-old building. With the most recent renovation having taken place in 1929, the building was filled with mold and mildew, the steeple had holes in it and the roof was ready to collapse. It was then they decided that something must be done to help restore this special church. “The congregation viewed the church as a symbol of hope for them and the community. It was their connection to the Gospel,” Lagus said. The restoration of the church's interior revealed beautiful frescos. In 1998, Lagus launched a letter writing campaign to friends, family and other contacts to solicit funds to help restore the church. “I wanted to do it in memory of my father. We had no idea of the response we would get and we were totally overwhelmed,” Lagus said. In her letters, Lagus conveyed that the 150-member congregation’s building was in a state of major disrepair, and they lacked funds to repair basic structural problems. Initial estimates indicated that $20,000-$30,000 would be needed to conduct basic repairs. “Once we got into the project, we found out the repair needs were much greater than originally thought. My husband, Arne and I took several trips over there to view the progress,” Lagus said. Lagus was able to raise over $90,000 through a series of annual letters. All contributions were appreciated and donors were personally thanked. Lagus noted that the contributors were from sixteen different states and the countries of Canada, Australia and Estonia. 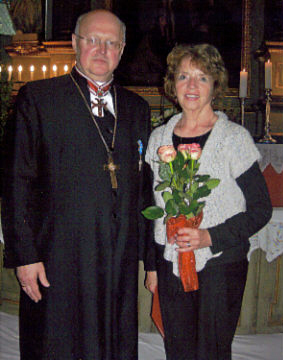 Bishop Tiit Salumae (left) presented flowers in appreciation of Lagus's (right) work to restore the church. The following projects were completed with the funds collected: restoration of the church roof and steeple, restoration of church doors, uncovering of ancient frescos in the church, restoration and placement of the original altar painting, replacement of the leaky parsonage roof, installation of a restroom in the parsonage and the addition of a security system in the church. Renovation that was done in the parsonage created another worship space used during the cold winter months. The ancient church has no heat available. Upon completion of the church roof and steeple restoration, Miriam and her husband Arne attended a dedication service in 2001 in Martna. A new church bell was dedicated on Aug. 21, 2011. In addition to helping provide funds for the church, Lagus has remained involved in its life by visiting the church to view restoration progress and communicating with the pastor and council president. The life of the 700-year-old congregation continues with regular worship and parish activities. While Lagus was able to make a large contribution to a church on the other side of the world, it was her education at Gustavus that helped to instill the importance of helping others. She states, “I am grateful to my parents and all who helped to make me a proud Gustie. I remember Dr. Edgar Carlson emphasized Christian values and ethics, which continue to be celebrated today in the Make Your Life Count campaign. He definitely inspired me,” Lagus said. After several years of helping others, Lagus emphasizes that many people helped make this project what it is today. “In 1996 I didn’t realize the impact this project would have on this old church but believed that something needed to be started. It was accomplished through God’s grace and the generosity of many. I’m thankful that I was able to spearhead this project,” Lagus said. Very nice piece, and good work, Mim!